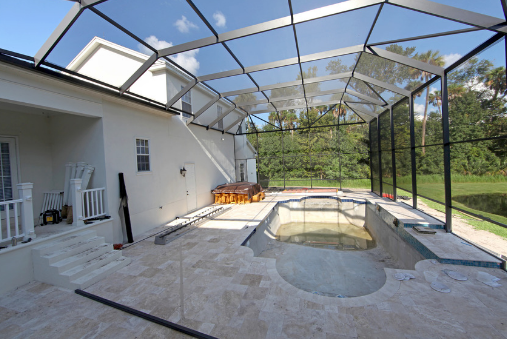 Pool surfaces are designed to last between 8 and 15 years. As it ages, your pool’s surface will begin showing some of these issues. If your pool’s surface looks a little shabby, not pristine as it once was, it may be time to resurface. A beautiful new surface adds to your pool’s value and the value of your property overall. Resurfaced pools look better than they ever did, making you feel as proud and pleased as you felt on the day you jumped in for your first swim. Find a qualified Licensed pool professional to resurface your pool. Make sure they have a contractor’s license! Do not use someone with a Pool Specialty License to redo your pool. They are not contractors and you will have no warranty and no protection under the law if you use an unlicensed contractor. If you can see the pool’s concrete shell underneath the plaster, you have a problem that must be taking care of immediately. You can think of these spots as abscesses that will continue to become larger and proliferate. These spots will have a much different color which makes them fairly easy to locate. While the pool’s structural integrity isn’t at risk, the surface seals and protects the shell underneath. Over time, water would penetrate the interior gunite or shotcrete and damage it. The pool’s surface is like the icing on a cake and should cover the shell completely. Once these spots are visible, it’s time to resurface. Water is quite an aggressive element – it is the universal solvent. Just as a river eventually carved out the Grand Canyon, water will eventually erode a pool’s surface and produce unsightly wear spots. Once you’ve installed a gorgeous new surface, you’ll want to help it last as long as possible. The best way to do that is to be sure the water has the right chemical balance. Having the correct percentage of calcium hardness helps protect concrete, plaster, and tile grout. Water can either be aggressive, in balance with or scaling to your surface. Pool chemical recommended balances are designed not only to be comfortable to swimmers but also to protect the surface. In order for the pool to be safe and comfortable to swim in, the water chemical balance may be more aggressive to the pool finish. We ensure this by making sure there is sufficient Calcium Hardness in the water. A delamination is an area of the surface where the plaster or other surface did not adhere physically to the underlying shell of the pool. This happens more often in re-plastered scenarios than in new construction but is found in both. It is always an application issue and must be addressed, usually with a total redo of the pool finish. If your pool’s surface has a delamination, which can feel spongy and springy, like a soft spot or a bubble in the pool finish, it means that there is an application defect and your pool needs to be addressed immediately. The problem will not get better and there is a risk the spot will pop off and create jagged edges. As your pool ages, the surface will eventually begin to etch and pit due to water being the universal solvent. The weakest areas of the surface will succumb first. These areas of the pool finish are prone to picking up stains as metals and minerals naturally found in our water deposit themselves on this more porous surface. That’s why older concrete pools are prone to developing stains and other surface flaws. While unsightly, these flaws aren’t damaging to swimming pools. The only way to fix these problems in concrete pools is stain treatments for minor issues and resurfacing for major issues. You typically won’t be able to brush out stains in concrete pools without first applying specialty chemicals. A chemical imbalance in the pool’s water can also contribute to staining as could metal leaching into the water, possibly from an old heater, iron in source water, or yard fertilizers. Lack of routine maintenance can also cause staining. When leaves and other organic debris are allowed to collect in the pool, staining can occur. Algae is another possible source of stains that can be very hard to get rid of. And, as said before, the best way to prevent many stains is to ensure proper pool care and the correct chemical balance in your pool water. Pool Troopers makes this easy for you. Tile will often last up to three times as long as plaster. However, the grout will corrode as it ages. Eventually, tiles could loosen and break. Loose tiles are another problem that may have been caused by a poor installation. Not only are broken tiles an eyesore, but they can also be sharp and could easily cut swimmers. For this reason, broken tiles should be addressed immediately. Loose tiles should be removed and reapplied correctly. Re-grouting of the pool tile is possible. A structural crack in your pool’s finish, one that goes all the way down to and includes the pools shell, is not a fault of the pool surface but of the underlying shell. It indicates a much more severe problem and needs to be addressed by a pool professional. These cracks can be the result of poor construction, groundwater conditions, poor or shifting soil conditions, exterior water forces, or unfixed pool leaks. If not fixed, the problem will get worse. Pool Troopers has been maintaining and safeguarding pools since 1952. We believe in providing exceptional pool service at an affordable price. We also offer the use of a free salt chlorine generator. To learn more, contact us today.